Need help quick, is this the speedo limiter on jap import 1000f? Could this be it and how do I go about disabling it? I saw the same post and yours where you said about the taped up filter. Went searching for the wire to cut and couldn't see anything so had a look around for video's on the issue and stumbled across one where a guy had an import 400 with the same restricted rev problem and he pulled his speedo apart (180km/h speedo) and saw it sitting in there, along with what he described as a magnetic washer on the back of the speedo mechanism. On my bike it was zip-tied in a not-so waterproof bag inside the right fairing. Had a quick search online to find out if the magnetic sensor (two black posts in the middle of it) needed a permanent magnetic source to stop it restricting or no magnetism to work right. 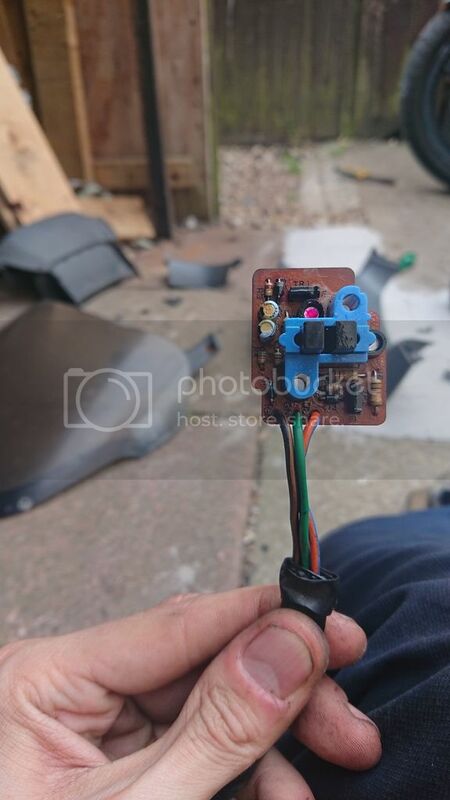 In doing so found a post on kiwi-biker or something saying "...yeah we get loads of jdm imports (cbr1000f) over here, I've always just found the 3 pin connector under the clocks, cut the brown/black and orange/blue wires and wire them together to fool the ecu into thinking that the bike is below the restrictor speed". He goes on to say that some add a 10kΩ resistor between them but he's never bothered and never had an issue. For my issue it would rev up in neutral to redline if I wot it but if I eased it up the revs it would stutter like hitting a rev limiter at exactly 5000rpm and do the same under load while riding it. After wiring it as above I can confirm that (in neutral at least) the bike is revving cleanly through the range now. Haven't had a chance to go out on it yet as family time means no play time unfortunately, though I will be back and post again after I've gone out and given it a proper shakedown blast. Anywho I hope this helps others with the same issue help to fix the stupid jdm restrictions. I got seasick watching that video. Last edited by hamlin6; 06-01-2018 at 10:09 PM. It doesn't start making power 'til 5000 rpm. That's a sad restriction. I guess it handicaps bigger bikes for a fare drag race against a 150cc scooter. Quick Reply: Need help quick, is this the speedo limiter on jap import 1000f?